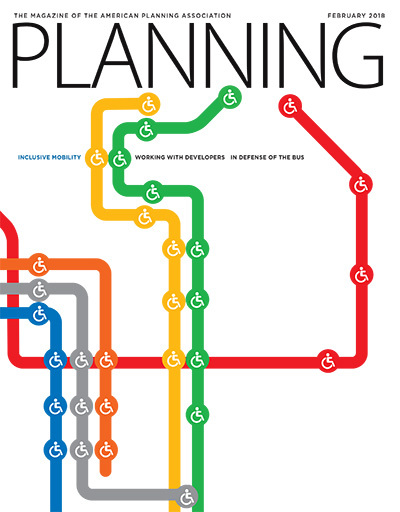 February's Planning cover story, "Inclusive Mobility," spotlights transportation systems based on universal design principles that facilitate movement by all community residents, regardless of age or ability. "In Defense of the Bus" gives props to a proven but often-overlooked transit mode, and "Better Together," the latest in Planning's "Business of Planning" series, offers five tested strategies for improving planner/developer communications. American cities have a lot of work to do when it comes to this vital part of universal design. Story by Steve Wright and Heidi Johnson-Wright. A handful of cities across the country are leading a renaissance in urban bus service, reports Jonathan Sigall. Universal design benefits everyone, explains Esther Greenhouse. In this Business of Planning installment, Linda McIntyre bridges the communication gap between planners and developers. Tax reform, Memphis statue removal, Texas parks nonprofit. Reid Ewing revisits growth management. Practical urbanism, food trucks, community resilience. Podcast roundup, net neutrality, documenting deindustrialization. Planning for people, not tax revenue.